..What Does The Picture Mean? The biofeedback information, recorded from the Aurastar 2000s handplate sensors, is illustrated in two different languages; the languages of colour and body. The various computer formats allow you to analyze the condition of forty-four organs and glands as well as interpret the thoughts and emotions held in these body parts. In the body dynamics of the aura picture and graph analysis, balance and harmony is illustrated two ways: by a vibrant green colour in the aura picture and by the parameter in the middle of the graph. The colours blue and yellow are in close vibrational frequency to green therefore, represent a fairly balanced energy and are shown as slightly above or below the centre of the graph. A higher or over-active energy is shown with the indigos and violets and is closer to the top of the graph. Extreme over-activity is displayed by pinks and whites and is shown at the very top of the graph. Oranges and reds are reflective of lower or under-active energies and in the graph are illustrated closer to the bottom, whereas very low energy is shown in the grey tones at the very bottom of the graph. Stress in an organ is displayed as fluctuating colours in the aura picture or amplification of the parameters from a high to a low value in the graph. Dull or murky colours shown in the body can also be read as the characteristics on a disharmonic level. 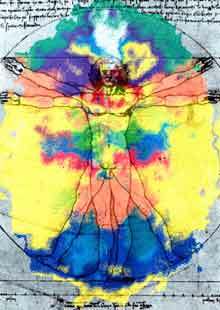 We can confirm the vitality of the organs and glands through understanding the language of colour. Colours above the head are defined as relating to the personality traits of that colour, thereby giving the practitioner/therapist an overview of the patients personality and how he/she interacts with their body. This data is supported by the Chakra Activity Report which allows you to instantly compare each chakra for the consistency of energy flow through the body. The Aurastar 2000 measures the normal range of activity for a chakra to be between 40-65%. For example, if a person has a Crown chakra reading of 80% and a Throat chakra reading of 23%, there is a difference of 57%. This may indicate a conflict between what the person thinks and what they outwardly express. Following is a brief analysis of an Aurastar full body aura picture. The colours above the head show a lot of high energies (white, blue and violet). These energies indicate a very spiritual person with a creative and active mind. Yellow also is connected to mental power and the green colour illustrates the traits of a compassionate, sensitive and loving person. When we compare the energy in the body area, we can see there is a conflict of energies in the root chakra and disharmony in the digestive system (seen as pink and yellow in the root chakra, blue, yellow and a murky red in the digestive tract). The breathing of this person is shallow and their overall vitality is low. In Ayurvedic medicine it could be said that this person concentrates more on their mental and spiritual abilities and does not breathe in the full life force (shallow breathing is usually shown as a yellow, orange or red colour in the heart parameter). They have many ideas but do not digest them (possibly a sluggish digestive system). By not putting thoughts into action, this person may not be proceeding forward in life. The conflict in this persons life could be related to a relationship issue (an imbalance of both high and low colour energies are evident in the root chakra). Also the emotional colour of orange is being shown in the arms and legs. In the science of body language, the arms represent what the person is giving to the world and the legs represent the action of how they are moving ahead in life. In Chinese and Eastern Medicine the meridian system plays an important role in carrying the chi or life force energy to the bodys organs and glands. The meridian energy is represented in the different reflex zones on the surface of the skin and certain thoughts and feelings resonate with certain meridians and organs. The energy of each organ and meridian system is like a circuit which connects joints, muscle areas and other organs to each other. For example, the lung and large intestine meridians are connected and responsible for the maintenance of the ligaments and muscles in the body. If anger and hatred resonate through these organs, the red colour frequency will be shown in these meridian zones and the person may be experiencing symptoms of constipation, asthma or stiffness of the spine and neck. Through the software program of the Aurastar system, you will see an overview of your clients energy through the graph analysis as well as the emotion or thought pattern formed in the body part through the interpreted traits of the colour vibration. The Aura Counselling Four-Day Course will help you understand the Aurastar features so you can combine Aura Counselling with your specific therapy as part of the clients healing process. ..Can I Use A Photograph Of The Client? 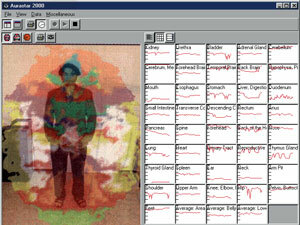 The program automatically displays the aura and the background picture of da Vincis Vitruvian Man. You have the option of using a digital camera (not included with the basic Aurastar 2000 system) which will show the clients photograph as a background in place of the vitruvian man or woman. An example is shown here.